Today my family and I headed up north ( about 10 miles from Canada) to go to a barbecue with about 6 other retired firemen and there spouses. Its always a good time and there is always plenty of good food. One of the firemen has a camp on a lake that only has about 4 or 5 other camps, and its super quiet and just really pretty. I am really not a nature girl though, bugs and snakes and fish are not really my thing. 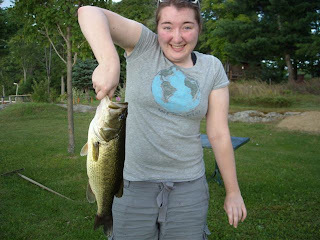 However my family all loves to fish, so I do have a bit of the fishing gene somewhere in me. My brother caught a 13 inch bass ( we were trying to catch a snake- well let me clarify I was trying to keep a eye out on the snack because I feared it would charge in the water at me)...and then I also caught a fish- 17 inch large mouth bass...the whole touching, holding, grabbing fish freaks me out but I always have amusing pictures with me and fish. I just really wanted to let go of that fish...I sorta kinda dropped it a few times...but don't worry all you Peta people, I let it go and it swam away off to make new fishies! Haha, us Peta people are glad it survived.